This classic written in the late 1700's by Ludwig Van Beethoven is considered his most famous work. Beethoven's Fur Elise is said to be a work of musical genius. Transcribed for fingerstyle guitar by Robert Tarchara, this arrangement truly brings this classic gem to life. 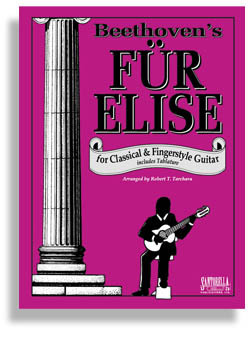 Fur Elise For Classical Guitar is only available from Santorella Publications. Copyright 2013 Santorella Publications Ltd. All Rights Reserved.